Three coincidences converge to make me wonder if I am crazy: I live in Park City, Utah. I live with major depressive disorder. And, I live with a compulsion to write about the natural world, a world being murdered. Park City is a place of obscene privilege. It is built on tourism brought by the ski resort industry. Close to 80% of the population is white, while the median property value is $868,100. The median household income is over $105,000 per year, which is almost double the national average, in the wealthiest nation on Earth. When you write about ecological collapse in a place like this, you will inevitably be called a “fear-monger” or “conspiracy theorist.” You will be reprimanded for causing widespread despair. You will be told that your words are “just too depressing.” You will be accused of overwhelming your readers and blamed for causing them to give up. You will be asked, and then told, to stop writing. I know despair. I know the kind of despair that douses your brain with stress hormones and licks your consciousness with the flames of an invisible, emotional pain. I know the kind of despair that injects your veins with an asphalt so heavy you can barely rock with the sobs forcing their way through your throat. I know the kind of despair that causes you to reach for a razor blade, a noose, a gun, or a bottle of pills with that last, decisive dose. I know the kind of despair that never quits, that lasts so long it becomes major depressive disorder. I’ve experienced despair so deeply, I tried to kill myself. Twice. I know despair and the last thing I want to do is cause the same experiences I’ve lived through to hurt someone else. So, I ask: Are writers and others who point out the reality of ecological collapse responsible for depression? Am I crazy, or are they? To understand if writers writing about ecological collapse are capable of causing depression, we must understand what depression actually is. The brains of depressives, through genetics or injury, are less resilient than they should be. Do we blame the written word for lupus? Multiple sclerosis? Eczema? Cancer? Of course not. If depression is an illness like other illnesses, we cannot blame the written word for depression. Can we blame writing about ecological collapse for small or malfunctioning hippocampi? Genetic variation? Again, of course not. What about early trauma? Child abuse? No. No. No. I find the medical explanation of depression to be inadequate. If depression is a failure in the body’s stress response mechanism induced by chronic stress what (or who) causes the chronic stress? Chronic stress is often taken as a given. Most believe chronic stress is an inevitable characteristic of human life that has been, and always will be, with us. But, the truth is, chronic stress has been virtually unknown for the vast majority of human history. It’s only been since the dawn of civilization that humans have experienced chronic stress, depression, and other illnesses chronic stress causes. Anthropological research demonstrates that depression and suicide are almost nonexistent in traditional, hunter-gatherer societies. If we peer far enough into our past, we will remember that all humans once lived as hunter-gatherers. One of the most famous examples demonstrating the lack of depression in hunter-gatherer societies is a study conducted by anthropologist Edward Shieffelin who lived among the Kaluli people of the New Guinea highlands for nearly a decade. He carefully interviewed over two thousand men, women, and children and found only one person who came close to meeting Western diagnostic criteria for depression. So, what happened? If the hunter-gatherer lifestyle was so good, why aren’t we still living it? If the hunter-gatherer lifestyle was so good, why aren’t we still living it? With the privilege and power agriculture grants humans over the rest of life, the violence intensifies. Soil can only yield so much, and the civilized inevitably strip their land bases of the necessities of life. They are confronted with a choice: Sacrifice privilege and power to return to a sustainable way of living, or turn to other land bases, where hunter-gatherers live, to extract the necessities of life. The history of civilization is also the history of traditional communities’ resistance to encroachment on their lands. The civilized gain a material advantage over the non-civilized by making a deal with the devil. In exchange for gaining a greater ability to perform violence, the civilized exploit the land. This exploitation grants the civilized short-term benefit at the expense of long-term sustainability. Hunter-gatherers, with cultures committed to sustainability, stand little chance. Not only are hunter-gatherers killed, their lands are stolen. Hunter-gatherers can only hunt and gather on healthy lands. Meanwhile, the civilized clearcut forests and divert rivers for crops. They consume ever more topsoil. They build fences and walls and enforce boundaries with superior weapons. They reproduce at astonishing rates and require more and more resources. With hunter-gathers’ game killed or scattered, with foraging plants cleared for civilized crops, with their water sources dwindling or poisoned, they have no choice but to participate in civilization. If we flinch, if we look away overwhelmed with fear, if we give in to amnesia, we may lose the entire planet. Blaming those who write about the murder of the natural world for despair is dishonest. Writing is not responsible for despair or the depression epidemic, the history of civilized violence, the physical forces that destroy traditional cultures, and the reality of ecological collapse are. The reasons for despair exist whether writers point them out or not. Overcoming the horror begins with the courage to remember the violence, to face it, to contemplate the enormity of the problem, and to properly diagnose the illness, so we may take adequate action. If we flinch, if we look away overwhelmed with fear, if we give in to amnesia, we may lose the entire planet. Understanding this comes with responsibility, the responsibility to fight back. I will not lie to you. There is no way to guarantee your safety. Opening yourself to the reality of the violence destroying the planet will hurt. It may overwhelm you with despair. The despair may linger so long it turns into a chronic illness like major depressive disorder. The process is not easy, but it is necessary. 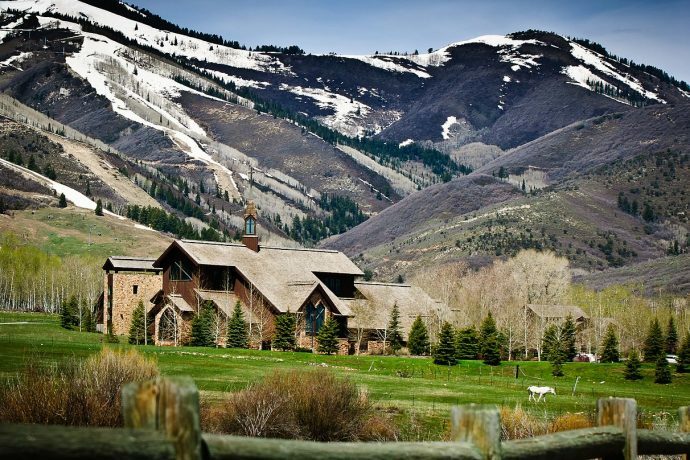 You may find yourself in a place like Park City where you are encouraged to forget the violence. You may find the reality of the violence breaks your heart so forcefully it gives you an illness. Then, you may find yourself compelled to defend a world being murdered. Three coincidences may converge on you to make you wonder if you are crazy. But, you’re not crazy. You’re alive and you’re brave enough to face the truth. Violence spawns privilege, and privilege, in turn, kills empathy. As empathy dies, a callus grows over the heart. Work, that would have been too painful to perform, becomes possible through the callus’ protection. The human capacity for violence grows. But, even violence is finite. There’s only so much to destroy. When one place is destroyed, the violence is exported, while the privileged reap the fruits of violence. The more thorough the violence, the farther the privileged are removed from the effects of their violence. Violence becomes invisible. And, then, the violence is forgotten. When violence is invisible and forgotten, the privileged begin to believe their privilege is natural and inevitable. The reality of violence, suddenly revealed and remembered, may rip the callus from the privileged soul causing excruciating pain to those who have forgotten. It may paralyze them, for a time. Or, forever. Whatever the risk, if the privileged wish to stand on the side of the living, the callus must be ripped off. The land remembers violence. We must remember, too. The land speaks, and the language is not difficult to comprehend. It begins with the desire to hear. If we listen, sincerely, the land will teach us of memory. Memories fall with the rain from a bruised sky over the Jordanelle Reservoir visible from my front porch. The rain mixes with the dammed waters of the once-wild Provo River. Wind, arriving from the north, stretches across a basin floor, rushes through a canyon’s mouth, and then stretches out again. Expecting its dance to last as long as the Great Basin, the wind rattles aspen branches, lifts red-tailed hawks to better vantage points, and shakes leaves from scrub oaks. The land speaks, and the language is not difficult to comprehend. It begins with the desire to hear. If we listen, sincerely, the land will teach us of memory. Then, the wind screams. The next canyon is submerged under the reservoir. The wind grows chill over the water, and angry. The wind remembers who called this canyon home. It whispers with memories of the Japanese relocation camp at Keetley, now flooded by the reservoir. It weeps for the lost blue strokes of pinyon jay wings between pine tops and juniper berries. It mourns the soft sight of mountain lion cubs wrestling in front of dens and the fierceness with which their mother protected them. The wind howls and refuses to let guilt be drowned. If you listen closely, you can hear the rain, the river, and the wind form an alliance to break the amnesia and the Jordanelle dam. All dams eventually fail, but it seems human amnesia will not. 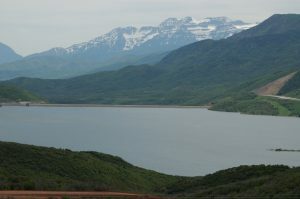 I watch oil tankers on US Highway 40 as they pass the Jordanelle Reservoir on their way from the Uinta Basin to refineries in North Salt Lake. I count them. Six in five minutes. I remember the babies killed by air pollution in Vernal. I remember the snow disappearing in Park City. I remember all those murdered, and being murdered. I pray the dam and the amnesia are destroyed.